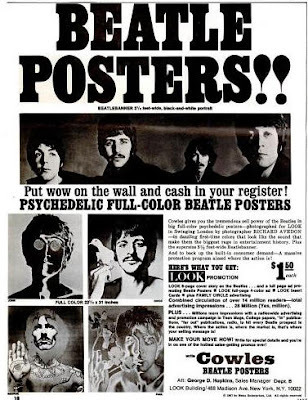 When the author of Advertising The Beatles, Ray Zirkle, was a young Beatles fan, he started to save all of the advertisements that he found in Billboard and Cashbox magazine that pertained to the Beatles. He took care of these pieces of Beatles history and decided to make a book out of his collection. His book is full of colored photographs of ads for Beatles items in chronological order. It is a beautiful book and the ad themselves tell a story of the Beatles through what was sold between 1963-1970. This is the only book I am aware of that features the advertisement in the United States. Since there were so many products available in the U.S., it is a great time capsule. There are ads for all of their records, Beatles buttons, wigs, concerts, movies, etc etc. I especially enjoyed the later years of the Beatles. The ads for Magical Mystery Tour, Yellow Submarine, and Let it Be were really colorful and interesting. It seems like you will see Beatles ads on Twitter or Facebook from time to time, but they are always early in the Beatle story. These later advertisements are a lot of fun. My only complaint about the book is that there are a lot of photos but very little text. I would like to know a bit more about the advertisements. How many wigs were sold? Who made the wigs? etc. There is some text, but I would like to know more. But overall this is a lovely book and one that is worth a good look through more than just once. I had no Idea you were gonna do this...I appreciate the kind words. let the real experts write the about them over and over... I am preparing a part two with the solo ads! Keep an eye open!